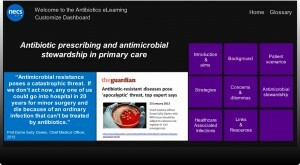 The antibiotic prescribing and antimicrobial stewardship in primary care eLearning programme has been developed by the NECS Medicines Optimisation Team, using best practice guidance and evidence based reviews. How do I access the eLearning? The updated eLearning programmes can now be accessed through the NECS learning website. This will allow you to track your progress, print out and save certificates, download a summary of key points from the e-learning, and leave feedback. If you have already registered for the NECS learning website click here to login to access the antibiotics and repeat dispensing eLearning programmes. If you have not yet registered, please click here to register (nhs.net email address required). Once registered you can log into the website and access the antibiotics and repeat dispensing e-learning from Medicines Optimisation. Click on the link ‘click here to subscribe to available eLearning courses’. Clicking on this link will open a new page and list the eLearning modules available to you. Click on the name of the eLearning module and then ‘take this course’ to begin. To move to the quiz at the end of the eLearning which will allow you to view a certificate if successful, please ensure you click ‘mark this lesson as complete’.